Who will be the last one up? It is an amazing unit to have a fun and safe fight. 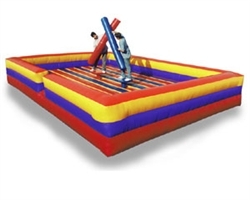 It is a 18X20 or 20X24 ft of inflatable mattress with a 2 pedestal at the middle. It goes with 2 poles and 2 helmets.